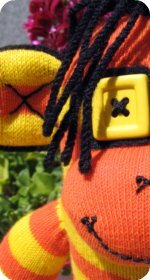 How to make a sock animal out of thermal crew wigwam diabetic socks. They make a snugly sock monkey. 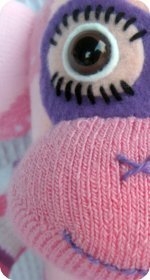 The wig wam socks are so thick, great for sock crafts to make any type of sock animals. Step one: You will need wigwam diabetic socks. 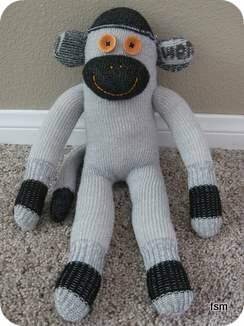 Follow the basic sock monkey pattern and instructions. 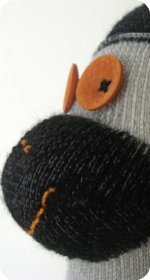 Eyes: Two large orange concave button eyes, stitched on to head with black thread. Ears and Tail: Although the tail and ears are not stuffed, they are still well formed because of the thickness of the socks. The socks are so thick in fact, they nearly didn't fit under the foot of my sewing machine. 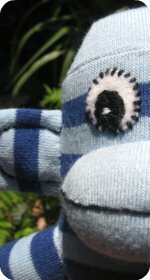 If you couldn't fit a pair of super thick socks under the foot of your sewing machine it would just be a matter of hand sewing your little sock animal together. Sure takes longer but still doable. 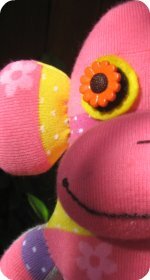 Stitch a mouth from the orange embroidery thread and do two french knots for the monkeys nostrils. This little fellas going to last for a long time and he'll be able to handle the rough and tumble and occasional arm and leg yanking from the kids. I find the thicker the socks are that are used for sock animals they are just that much sturdier, all relative really and when they are as thick as this pair you don't need as much stuffing and the end result is an extra squishy monkey. Even the ears are puffy and so squeezable. 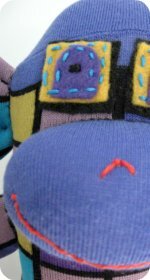 TIP: Making sock animals out of thick thermal wigwam socks is great because the socks are so sturdy and thick which make it so easy to stitch together. 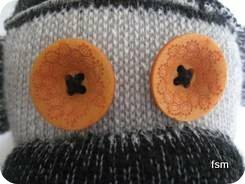 It is fun and handy to have a stash of spare buttons available for the eyes. 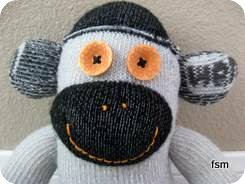 Some sock monkeys suit felt eyes but buttons do a great job and are easy to stitch on. 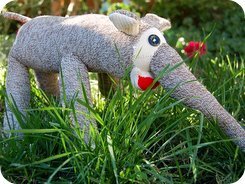 Head over to the sock elephant page if you want to have a go making an elephant buddy. The elephant I made above really isn't the best looking one I've ever seen but.... that's what it's all about, just constructing them and enjoying what comes out the other end. There really is a point when they are ugly enough to be cute.